David Luger concentrates his practice on complex litigation, arbitration, enforcement proceedings, internal investigations, regulatory actions and other disputes related to the financial services sector. He has represented clients before the Securities and Exchange Commission (SEC), Commodity Futures Trading Commission (CFTC), the Financial Industry Regulatory Authority (FINRA) and other regulatory bodies. 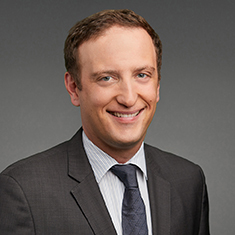 David also has significant experience litigating complex commercial cases. He has represented clients in the pharmaceutical, technology, industrial supply and transportation industries in state and federal courts around the country. Additionally, David dedicates a significant portion of his practice to pro bono work. His most notable accomplishment came in 2015 when he, along with a team from Northwestern's Bluhm Legal Clinic, obtained an exoneration for his client, Jason Strong, who was wrongfully convicted of murder. David began working on the case in law school and continued over the next seven years to work to overturn Jason's conviction. Along with the Northwestern team, David drafted state post-conviction and federal habeas petitions and reinvestigated the decade-old case. David and the Northwestern team met with the Lake County State's Attorney's newly formed wrongful conviction case review panel and demonstrated that the state's case against their client was deeply flawed, presenting reports from two forensic pathologists who concluded that the medical evidence contradicted the state's theory at trial. David's client was the sixth inmate cleared of a major felony in Lake County, Illinois since 2010 and his team's efforts were featured in a front-page Chicago Tribune article.